Hog Haven Farm is a recognized 501(C)(3) nonprofit organization in Colorado. Located on the eastern plains, about 55 miles east of Denver, our mission is to provide a safe, happy home for potbelly pigs and commercial pigs that are rescued from situations of abuse, neglect, or abandonment. Our mission is to provide a safe environment for potbelly pigs and other livestock that are rescued from situations of abuse, neglect, or abandonment. HHF strives to promote compassion for all animals, and to allow livestock animals to live happy lives without fear and suffering. We are currently home to more than 95 pigs, as well as other rescued animals, totaling more than 100 animals in our care. • Lobby for certain counties (i.e. 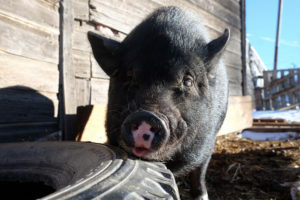 Aurora, Castle Rock) to amend zoning restrictions on potbelly pigs; currently they are considered livestock and not allowed. Homeowners may amend individual zoning on their home, but process is difficult and doesn’t yield positive results. Please visit our other online resources for more information.